Tuesday, Nov. 20th marks the 12th annual Ping Pong Palooza and you can register right here. Break out the paddles, and practice your backhand! The Sapphire Foundation for Prostate Cancer (SFPC), Vegas’ premiere 501(c)3 benefitting men with prostate cancer and dedicated to advancing research, supporting patients and creating hope for the prostate cancer community, is once again hosting the world’s largest mixed table tennis tournament, Ping Pong Palooza! 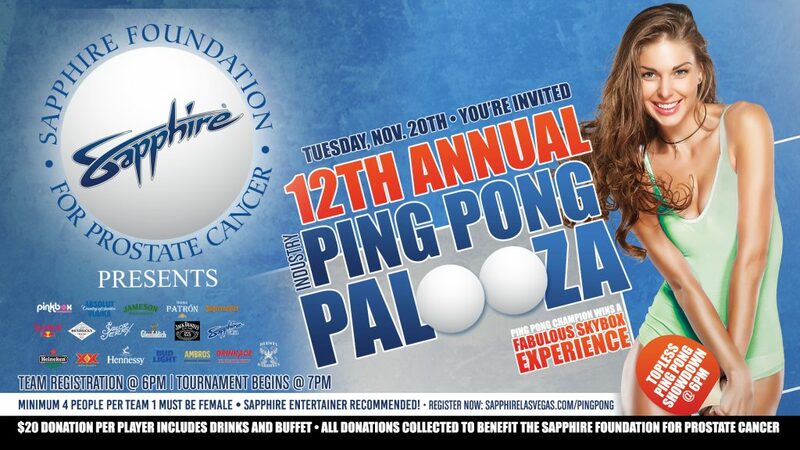 On Tuesday, November 20th, the Sapphire Foundation for Prostate Cancer invites Vegas industry pros, fun-havers and philanthropists alike to participate in the 12th Annual Ping Pong Palooza fundraising event to be held at to the world’s largest gentleman’s club. In recent years, paddle masters and ball-busting ladies have turned out to compete, representing various companies such as SLS, Hyde Bellagio, Beauty Bar, El Dorado Mexican Cantina, Crawl Vegas, and Tao Nightclub. Originally inspired by Christopher Walken film, Balls of Fury, this industry favorite event has matured into one of the most revered events held at Sapphire. Teams must have minimum of 4 players. At least 1 female player (You can always pick up an entertainer to be your female player…*recommended!). $20 per player includes drinks and buffet. Raffles and trophies for 1st thru 4th place! Day of the event registration starts at 6pm, cocktails & complimentary food. Tournament starts at 7pm. Good luck everyone! Arrive early to register and watch the entertainer contest from 6pm to 7pm.